Did you catch that moon last night? Wasn't it gorgeous! The Professor, who was driving home, called to alert me to step outside. Glad he did otherwise I would have missed it. I grabbed my camera and took a few shots. No time for tripods. The days are growing shorter. Have you noticed? Something about September makes me a bit melancholy. over the end of summer. Yes, I do pine a bit (not to be confused with 'whine' a bit), to the loss of summer days. I didn't get to see the moon last night, but I did catch a glimps of it this morning before dawn. It's a georgeous Harvest Moon. Last night we had a lightning storm that was rather impressive. I did NOT go out to take photos. I grabbed some shots of the moon myself last night - love yours with the branches in front. Even with our heat, I can feel autumn is here. Trying to enjoy the best of both worlds right now! there is not end to summer here, so come on down to your place in the sun. it is 101 in the back yard right now. the moon this morning at 4 am was so bright, we could see the bottom of the pool like it was lit. Sorry Reena...I won't miss Summer at all! I love the Autumn and all that it brings....summer will be back with us soon enough. Having spent 21 years in Texas has made me appreciate the three other seasons you never get to experience there. i am ready for fall. pumpkins, mums and apple cider....i am always excited for each season as it arrives!! oooohhhhh and the pictures are great. the hubs and i talked about the moon, but that's as far as we got!! Beautiful words and fantastic captures of that gorgeous moon! Our whole summer was about three weeks long! Your words express my feelings exactly! Have a great day anyway, Reena! Thanks for sharing the beauty! Yea, I'm bummin'. I left work late yesterday and noticed it was darker than normal. I need to sneak in a few more riding days in the next few weeks. I saw the wonderful moon last night, but I didn't take a picture. I'm looking forward to Fall and Winter. By the end of Summer, I'm sick of being roasted, and ready for the cold. Ask me at the end of February, however, and I'll tell you how much I am looking forward to Summer. You pine and I whine. I hate to see summer leave. I added your blog to my blog list so I can catch your new posts. Actually, I did see the moon last night and also the night before and this morning too. The sky has been very lovely lately. Your photos and the colours in them are astonishing - absolutely crisp and clear. I love the black and purple - just love it! 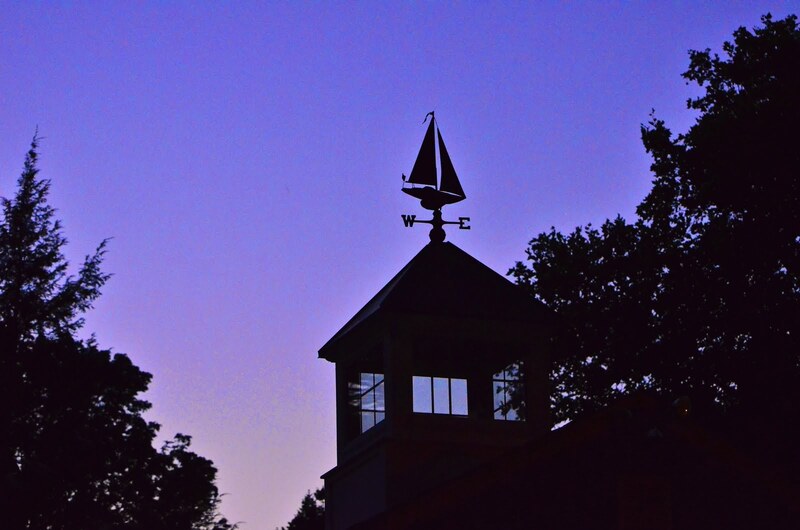 I could look at that last photo with the purple sky and silhouetted weather vane all day. I too am lamenting the end of summer this year. Winter was too long in these parts. I just have to shake my head at those lamenting summer's end. I would so gladly change places with you for even a short time. We still have a couple more days of hitting the century mark! Oy vey! But I have noticed that the days are getting shorter. That's about the only sign of fall I've seen. I awoke to a light shining evermore brightly in my bedroom. I peeked through the blinds and there she was THE MOON in all her splender. What a blessing it was to behold such majesty. I, too, have noticed the days getting shorter. My mother, who passed away in 1992, used to love this time of the year. Her birthday is in October. I love the Autumn. The golds, crimsons, greens, rusts, oranges, purples. "Autumn In New York" is a fave song of mine, too. Cheers!! I love your writing and photos. I signed up as a follower just to see your pix. I love yours...thanks for sharing. I love night photos. 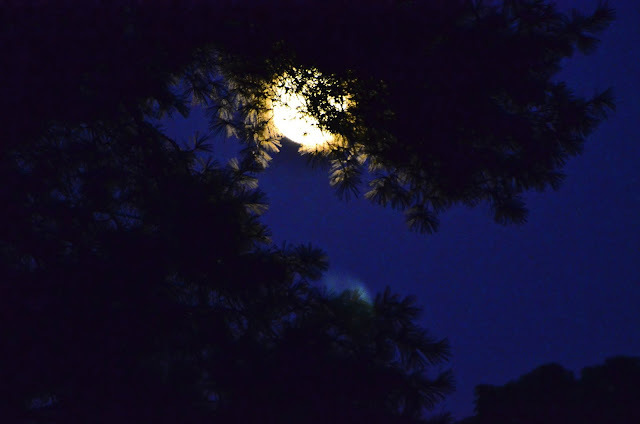 And the shy moon, hiding behind the crown of a tree - just lovely! I can only imagine the crisp air of a fresh early autumn night.I can imagine, I say, because we've been in a kind of storm for the past 48 hours. You took the words right out of my mouth. I hate saying goodbye to summer. It is my favorite season. I wish I lived in a land of eternal summer. Navy blue, night moon, September, a perfect ensemble for melancholy. I actually whine about it ~ I've got to move somewhere warmer one of these years. The Indigo Sky shot is so wonderful. Reene, I was so hoping someone in blogland with a great camera would take a picture of the moon last night for me. Bless you child. It was beautiful, wasn't it? After 5 days without the internet at home, we're finally back online and I've really enjoyed your stunning pictures and beautiful words from your Maine adventure as well as for the Moon that welcomed you home! I did happen to see the moon last night and it was beautiful. I grabbed my camera too but my shots didn't come out nearly as good as yours did. the cooler fall temps are a welcome relief but fall does mean winter will be next and I would rather just skip that. Your moon shots are fantastic! It's warm here (90 degrees) and it won't feel like fall for a month or so. I'd be happy to trade with you! :) I'm ready to let go of summer. So do I .. all the same. Its going to freeze here tonight. Love Love your moon shots. Gorgeous picture....yup, we had the beautiful moon, but not the lovely tree to set it off and give it some perspective. Thanks for sharing! I hate to see summer end here in Oregon. Lovely images and so true words. It was summer yesterday and autumn today. Hi there - nice shots of the moon. Always like it when you feel like you have stolen an image you may have otherwise missed! Day lenght - think about it. If its getting shorter for you its getting longer for me - so (on average)nothing has changed! I did notice the moon. It was gorgeous. I really don't like the shorter day especially after the time changes. Thanks for the reminder that I need to enjoy every minute now before it starts getting dark really early. What gorgeous color here. Maybe it's one of the benefits..the hidden prizes in the season's change?? We're having some of the best weather we've had all summer. In August the light shifts and I struggle. These past few days have felt like a reprieve. I am afraid summer is gone here ~ we had a touch of frost last night! sigh... I will hope fall stays for a great length of time. Hey, don't be sad at the ending of summer, it will be back, I bet. Beautiful photos. Yes, I did see the "Harvest Moon" last night, but did not have a chance to grab my camera at the time. As far as Summer slowly leaving, I'm not that really disappointed. I enjoy the change of the Seasons, especially Fall that is approaching. Each Season has it's own appreciation. Fall is my favorite time of the year. Nature puts on a show of color for the last time before ole' Winter arrives. I will be "out there" as Fall comes to us. Oh my!!!! Such wonderful evocative shots!!! They perfectly picture the sigh, longing, and languishing. They are moody and beautiful!!!! And I just caught up on your last Maine post, I am mourning at the loss of that, I have LOVED them. I could never get enough of these Maine pictures and they get better and better, a feast for the eyes!! Can I ask what photo editing program you use? 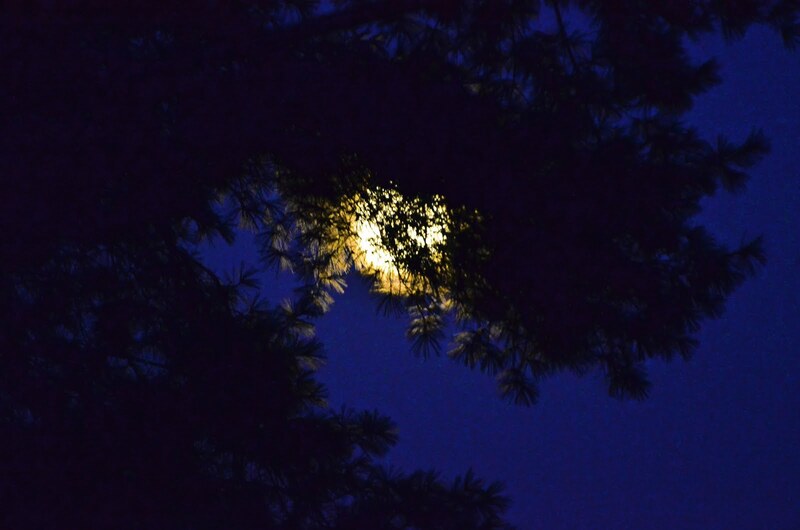 The moon was peeping through our pines too..my pic has a pinkish hue to it. I'm posting it on Friday. 90 here today and tomorrow then bang Thursday night temps drop and we hear it will hardly make it into the 60s on Friday. The cloud cover was too heavy here to see the moon for the past couple of nights. You certainly caught some beautiful images of it. 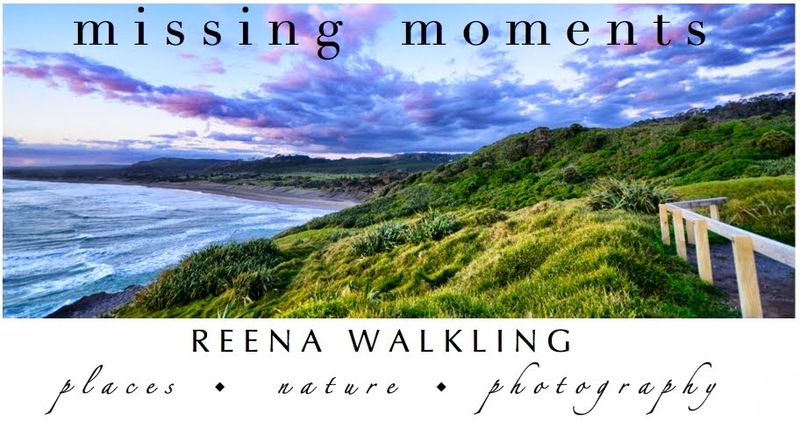 Stunning night sky photos Reena! beautiful colors in those shots- so intense! these shots are so dreamy and beautiful, love them! That last shot is magnificent! I love the colours that signal the end of summer. Mine is terribly boring. Beautiful post. Hey! How could I miss the weather vane? I guess I was blinded by the night - LOL! Geez. Cheers!! Yes the moon has been delightful over the past few days. What beautiful photographs these are! The weather is changing very quickly. When I walked to work this morning, it was only 35 degrees!